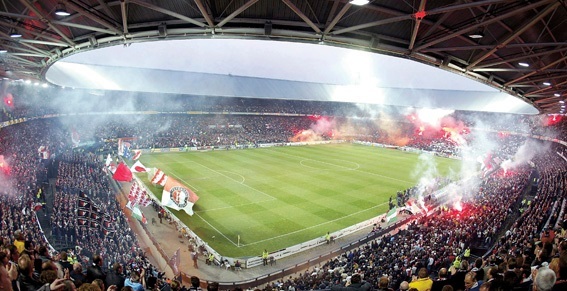 De Kuip, the home place where Feyenoord Rotterdam play there home matches. Dutch Soccer tournaments can arrange stadium tours to include club museum visits at some of the biggest and most successful clubs across Europe as part of your package. The tour will take you behind the scenes across all areas of the club with an experienced tour guide providing all the history, tradition, nostalgia while sharing some of the most interesting facts about each club. There are some great photo opportunities throughout the tour and a walk through the museum will take you through each chapter in the clubs history. These tours are not only great fun but also a fantastic insight into match days and behind the scenes of prestigious football clubs. Each tour will lead you into the Club Shop where you can purchase your favourite players shirts, clothing & club memorabilia. The Club visits are always a great opportunity to relive some the greatest moments of the clubs history. Dutch Soccer Tournaments will arrange a Stadium Tour as part of your schedule and tour itinerary (subject to availability). FEYENOORD Rotterdam (De Kuip) From Wednesday til Saturday. Sunday Closed ! Matchday Tours only take place prior to Feyenoord's home games. The guided tour takes 60 minutes. The rate excludes admission to the game. Matchday tours only take place prior to Feyenoord's home games. The guided tour takes 60 minutes. The rate excludes admission to the game. With your guide you will be able to access areas that are normally out of bounds for the general public. Imagine you are a member of the match-day squad as you walk through the unique De Kuip tunnel onto the pitch, sit on the seat normally reserved for head coach Giovanni van Bronckhorst and learn more about the proud history of club and stadium at the Feyenoord Museum. Players like Coen Moulijn, Willem v Hanegem, Ronald Koeman, Ruud Gulit, Giovanni v Bronckhorst ( Coach), Roy Makaay, Robin v Persie. The fantastic Amsterdam ArenA Stadium Tour takes you on a behind-the-scenes guided tour of the Netherlands’ largest stadium, the Amsterdam ArenA. This world-class stadium is located in the southeast of Amsterdam and is the legendary home of the Ajax football team. This fun Amsterdam ArenA Stadium Tour is a must-see attraction in Amsterdam for any football fan. A 75 minute-long tour with enthusiastic guideVisit to dressing room & press room, Ajax Gallery of Fame visit and Fan Shop stop, All guides speak both Dutch and English, Free WiFi. The Ajax Dressing room cannot be visited during training or match days (home or away), due to team occupancy. Different departure times are applicable on training and match days, furthermore the Ajax Gallery of Fame might not be accessible on match days.